Liverpool midfielder Sebastian Leto has agreed a two-year loan deal with Olympiakos after being denied a work permit to play in England next season. 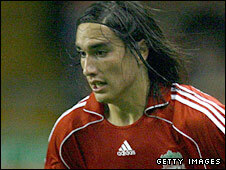 The 21-year-old Argentine, who joined the Reds from Lanus for around £2m in 2007, was granted an Italian passport last summer but it was later revoked. That left Leto needing a work permit but Liverpool's application was refused by the Department of Work and Pensions. And he arrived in Greece on Monday to complete his medical with Olympiakos. "Olympiakos is a challenge for me. I know I will be here for two years," Leto told the club's official website. "Olympiakos are a great team who challenge for every honour in Greece and in the Champions League. On Monday, Liverpool manager Rafael Benitez expressed his belief that the decision not to give Leto a work permit was unfair. "I am disappointed and it was a surprise because this is a player who has played in the Champions League and been in the Argentina squad for the Olympic Games," Benitez told Liverpool's website. "You have managers talking about how good he is, so I think the system needs to change. "We have maybe eight or 10 teams in Spain, Italy and Greece asking about him. When you have eight or 10 teams asking about a player and he's not playing, it means that he is good." Benitez remains confident that Leto still has a future at Anfield, however, adding: "He has a long contract, and I think he can impress and next year will be a different situation." Leto played four times for Liverpool last season in the Champions League and Carling Cup but is yet to make his Premier League debut for the club.